To future Goodwin College grad Dena Booker, there are few things as wonderful as seeing one of her youngsters make a new learning discovery. 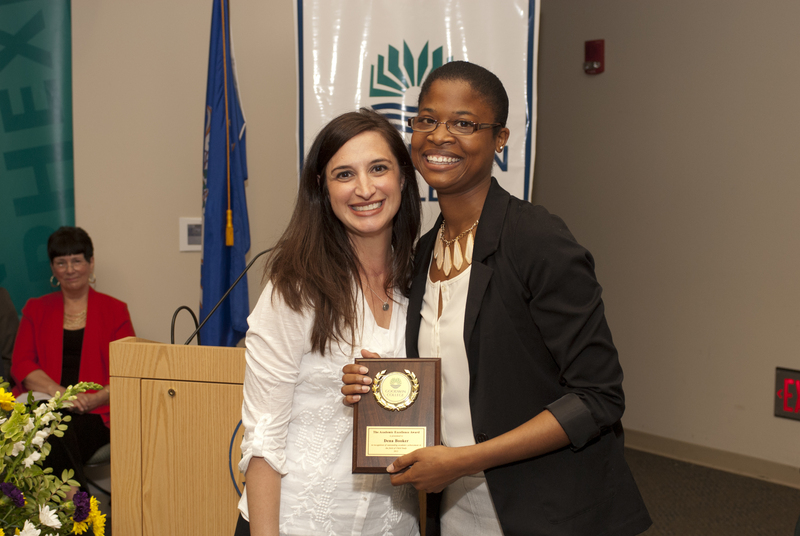 Child Study Program Director Lori Blake presents 2013 Valedictorian Dena Booker with the Academic Excellence Award at a ceremony held on May 30. Even as she has been inspiring her students, Booker has been immersed in her own learning, often sacrificing time out with friends in pursuit of her Bachelor’s Degree in Child Study. But, as the 2013 valedictorian can now attest, it was time well spent. On Thursday, June 6, Booker will be one of 30 students to receive a baccalaureate degree at the Goodwin College Commencement Ceremony. As valedictorian, she has the honor, as nerve-racking as it might be, of addressing the graduates, their families, and the Goodwin faculty and staff. “I’ve learned so much as a professional because of what I’ve learned at Goodwin,” says Booker, who balances school with her duties as head teacher at the Paraiso Infantil Preschool in Hartford, where she was formerly a literacy assistant. 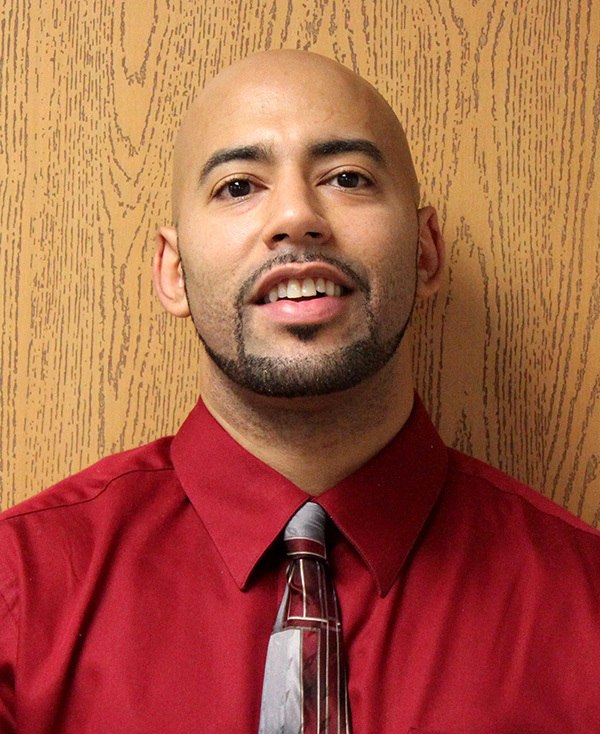 A 2003 graduate of Windsor High School, Booker has spent much of the last decade immersed in higher education. Initially, she wanted to be a high school guidance counselor and headed to Greensboro College in North Carolina. She transferred to Central Connecticut State University, where she commuted to class from home. In 2007, she graduated with a degree in Psychology. Her professional ambitions began to change when she got a job at a preschool, where she found inspiration in her students. “I realized this is something that I really enjoy doing,” Booker says. Upon the advice of colleagues, she enrolled at Goodwin College in the baccalaureate program in Child Study. Though she had already obtained one degree, she says her experience at Goodwin was different because it was more focused. As undergrad just out of high school, she was still trying to decide what she wanted to pursue. At Goodwin, she had already realized her ambition and was ready to make it a reality. Lori Blake, director of the Child Study Program, says that Booker has many attributes that lend themselves to building great relationships with children. Among them are Booker’s leadership skills, sense of humor, lightheartedness, and rapport she has with the children she serves. Booker says she has found a great atmosphere and has grown very close to her instructors and classmates. She carried her involvement beyond the classroom as president of the Early Childhood Club, an organization dedicated to helping Goodwin students to excel as leaders and make positive impacts in the lives of the children they serve. Prior to enrolling at Goodwin College, David Mifflin had a comfortable yet professionally unfulfilling life. He was gainfully employed and a member of a union, earning a decent living wage. However, he wasn’t truly happy with the direction his career was taking. Nursing Student David Mifflin is the winner of the Wireless Zone scholarship and will be a speaker at the “Under the Big Top” Gala. David’s sacrifices led him to Goodwin, where he has thrived in the Nursing Program and risen to the top of his class. He will be a featured speaker at the “Under the Big Top” Gala, where he will share his story. Raised in New Britain, David now lives in Cromwell and commutes to campus and to Bristol Hospital for class and clinical work. Though intelligent and articulate, David’s educational path has included many hurdles that have taken some time to traverse. David admits that when he was younger, he lacked the focus to stay involved in his education and fell in with the “wrong crowd,” leading him to drop out of New Britain High School. But his educational journey hadn’t come to an end, just a pause. He enrolled in Job Corps, gaining new skills. He moved to Maine and eventually got his GED, then found work in a Farmington machine shop. Inspired by the advice of friends, David decided that he wanted to be a nurse. That decision brought him to Goodwin College, where he has found his professional passion. “I love nursing. I love working with people and helping them out,” David says. Since 2010, David has been diligently working toward his degree. The work and study load has been intense, and he’s had to balance work and family with completing his degree. On a typical day, he works overnight, then takes a quick nap before studying. He says through his instructors, he’s become a more competent student and that his continually pushed to do better. “They’re helping me to make it to that finish line,” says David. Recently, David’s hard work has begun to be rewarded. He was selected as a recipient of the VNA Healthcare Florence Nightingale Award Scholarship, given to students who have been recommended by their professors. He earned the support and endorsement of Nursing Director Jan Costello, who recommended David and fellow Nursing student Lauren Wiedrich for scholarships. Both were awarded their $500 scholarships at a May 9 event. Mifflin says he was surprised to receive the scholarship, though it was just the start of the accolades he would soon receive. Recently, he was selected as a winner of the Wireless Zone scholarship, a $2,000 scholarship awarded to a nursing student who has progressed through the program and demonstrates extraordinary merit. On Thursday, June 6, Goodwin College will award nearly 600 degrees and certificates to students, marking one of the largest graduating classes in the school’s history. T. Boone Pickens will receive an honorary doctorate in Humane Letters. He is pictured here in a 2009 visit to Goodwin. The College will hold Commencement on campus, One Riverside Drive, beginning at 6:30 p.m. More students are walking in the ceremony than in any previous graduation held by Goodwin. The ceremony will take place under a gigantic tent, which is already installed on the quad outside the main building. Commencement will take place outside, rain or shine. Goodwin College is conferring a total of 596 degrees or certificates. Thirty students will receive Bachelor’s degrees in Nursing, Health Science, Child Study, or Organizational Studies. The latter is being awarded by Goodwin for the first time, with Organizational Studies established as a baccalaureate program in 2011. Additionally, the College will award 435 Associate in Science Degrees across a wide array of disciples and 131 certificates for several programs offered at Goodwin. Goodwin will award an honorary doctorate in Humane Letters to energy mogul, T. Boone Pickens, creator of the Pickens Plan for utilizing wind power and natural gas to solve the country’s energy crisis. 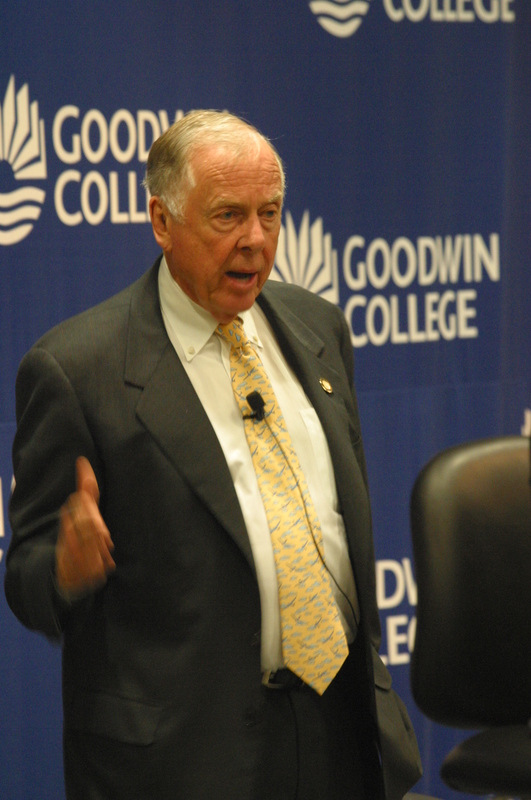 Pickens visited Goodwin in 2009 and will address students at the 2013 Commencement. He is a proud alum of Oklahoma State University, where the football stadium bears his name. Two graduates will also address their classmates at Commencement. Dena Booker, who is receiving a Bachelor’s Degree in Child Study, is the 2013 valedictorian. Booker is a resident of Windsor and is a classroom teacher at the Paraiso Infantil Day Care and Family Center in Hartford. The other graduate speaker will be Vaughn Martin, who will receive his Associate’s Degree in Nursing. Martin is a veteran of the U.S. Marine Corps and enrolled at Goodwin through the Yellow Ribbon program. He is also a student worker at the Hoffman Family Library and the former president of the Goodwin College Student Nurse Association. Goodwin College is moving forward with a remarkable new program designed to help employees earn the skills, credentials, and certification needed to advance in the field of high tech manufacturing. 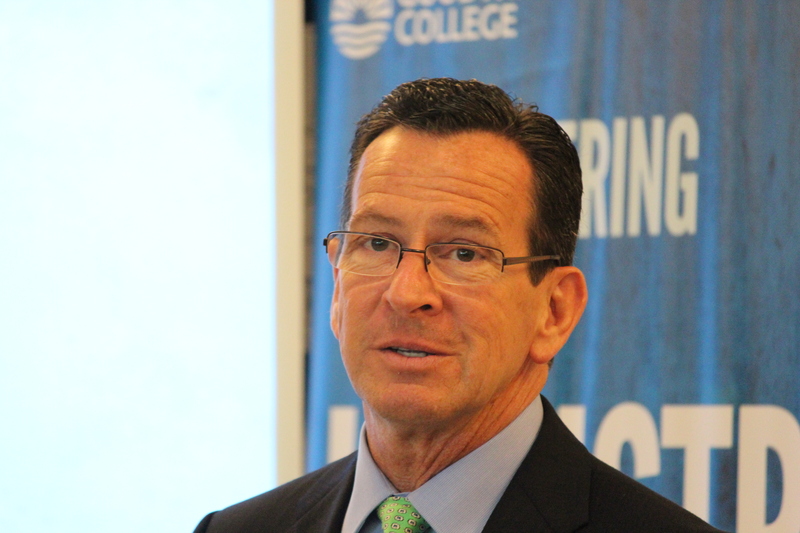 Connecticut Governor Dannel Malloy congratulated Goodwin and its partners on the Manufacturing Initiative. On Friday, May 24, Congressman John Larson, Governor Dan Malloy, and a host of other leaders in manufacturing joined the College as the Certified Production Technician program was introduced. A large crowd of employers, state and local officials, and media packed the Community Room to learn more about the program. Like other Goodwin initiatives, the program is designed specifically to help students get good-paying jobs in a field that is very much in demand. Connecticut has long been a leader in manufacturing, and with a generation of Baby Boomers entering retirement age, there are thousands of positions just waiting to be fulfilled by qualified and certified workers. Congressman Larson has been instrumental in implementing the program, which has begun with a pilot class of students enrolled in hybrid courses. Curriculum includes instruction by industry veterans, online programming, and on-site training at the Connecticut Center for Advanced Technology (CCAT) in East Hartford. Once they complete the program, the students will earn certification through Manufacturing Skill Standards Certification. 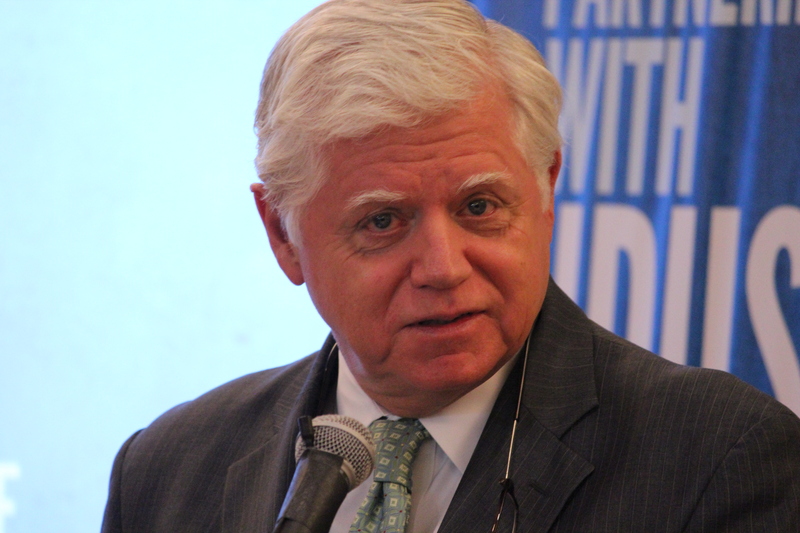 Congressman John Larson was instrumental in helping Goodwin College establish its CPT program. Goodwin President Mark Scheinberg said that in the past, students had to choose to either attend college or entering the manufacturing workforce. By partnering with manufacturers, the College has created a program that marries the concepts of education and workforce training into a new concept. “It doesn’t have to be a fork in the road,” Scheinberg said. Richard Michalski, General Vice President of the International Association of Machinists and Aerospace Workers, compared the concept to continual training for medical workers. Just as doctors learn new skills and technologies to expand medicine, high tech manufacturers can make breakthroughs by continued training and education. 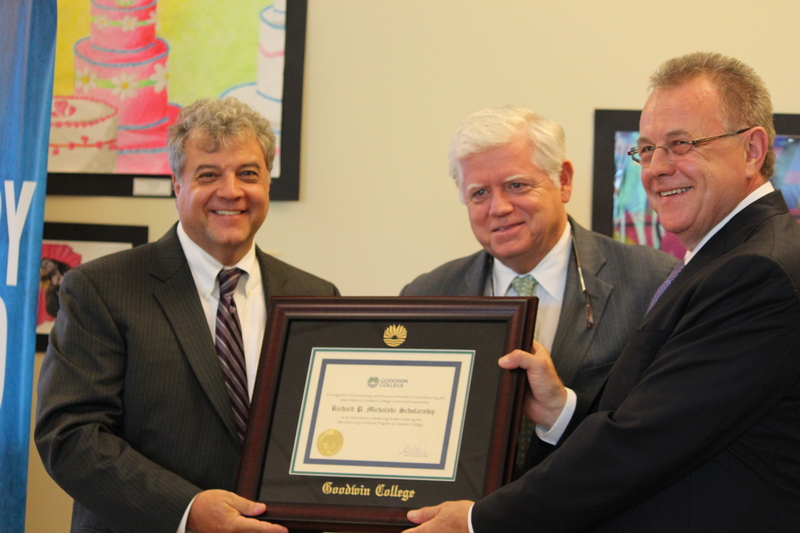 Goodwin President Mark Scheinberg and Congressman John Larson present Richard Michalski with his namesake scholarship. Michalski is retiring this year, and in recognition of all he has done for workers in his industry, Goodwin has created a scholarship in his name. Elliot Ginsberg, CEO of CCAT, said the state has been patient in waiting for a program like this to come along. “We are very thrilled and proud to be a partner in this program,” Ginsberg said. The Associated Press published an article on Friday in advance of the launch. The Hartford Business Journal is one of the first local publications to feature the program. Goodwin College is set to unveil a new manufacturing initiative designed to help the state of Connecticut meet a critical need for a credentialed and skilled workforce. Friday, May 24, Congressman John B. Larson (CT-01) and Governor Dannel P. Malloy are expected to join state and local officials and area leaders in manufacturing to announce the initiative. Press is encouraged to attend the event, which will take place at One Riverside Drive in East Hartford at 11 a.m. in the Community Room. High-tech manufacturing is at a critical point in Connecticut. In 2011, there were more than 22,000 manufacturing jobs advertised in the state, with figures expected to rise dramatically as a generation of credentialed and skilled workforce retires over the next five to ten years. As Baby Boomers reach the end of their careers, they leave with years of institutional knowledge and skill that is essential to a healthy, vibrant workforce. Goodwin College’s new initiative seeks to help employees advance in their careers through training and credentials necessary. In early May, Goodwin launched a Certified Production Technician (CPT) pilot class of students seeking credentials through Manufacturing Skill Standards Certification (MSSC), an industry leader in training and certification. All instructors are MSSC certified and students are earning credits through the CPT program, featuring a hybrid curriculum of courses both in the classroom and through interactive virtual simulation. This 6-credit certificate program is comprised of four modules including, Safety, Quality Practices and Measurement, Manufacturing Process and Production and Maintenance Awareness. At the May 24 launch, the College and officials will explain the need for this initiative and its benefits. For more information, visit the webpage for the Certificate in Manufacturing and Production Program. In what is sure to become an annual tradition, Goodwin College held its first Honor Societies Induction Ceremony on Friday, May 17. More than 180 students were inducted into five different honor societies. A large crowd of the students’ guests joined the Goodwin Community in the packed Auditorium, where the students were inducted during a moving ceremony. “These honor societies recognize and encourage academic achievement and provide opportunities for individual growth and development through honors, leadership, and service to community,” said Judy Zimmerman, Goodwin College Vice President for Academic Affairs. Executive Vice President and Provost Ann Clark also congratulated the inductees. 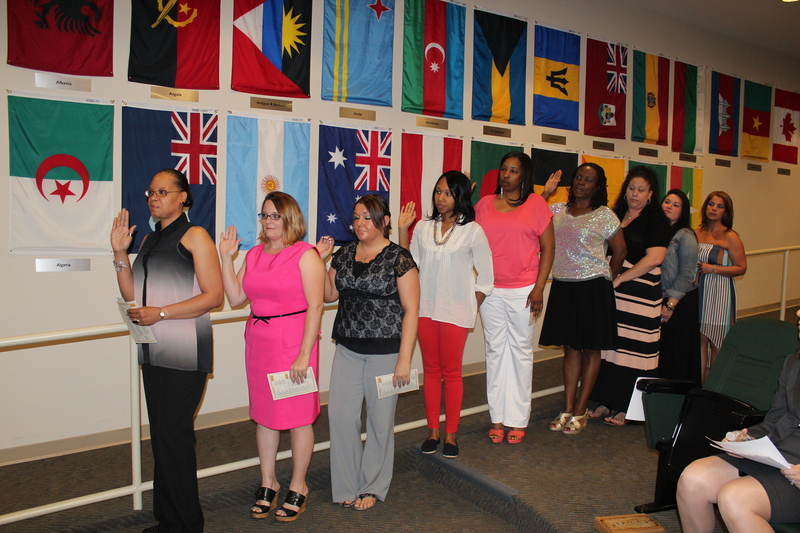 The new members of the national honors society for Human Services Tau Upsilon Alpha take their oaths. The evening began with the second cohort of Goodwin students to be inducted into Tau Upsilon Alpha, the national honor society for Human Services. Program Director Jack Matthews made the induction. Next, Melanie MacLeod, Clinical Coordinator for Respiratory Care, inducted Goodwin’s first-ever class into Lambda Beta, the honor society for Respiratory Care. Students from across the Goodwin College spectrum of majors were then inducted into Phi Theta Kappa, the pre-eminent national honor society for two-year colleges. Laura Donner, the Goodwin College Academic Progress Coordinator, made the induction of more than 50 new members. Professor Teresa Twomey and Nursing Program Director Jan Costello next inducted the newest group of students to qualify for Alpha Delta Nu, the national Nursing honor society. Finally, Professor Ernie Varela, Co-director of the Organizational Studies Program, welcomed the charter group of Goodwin baccalaureate students into Alpha Sigma Lambda, the largest national honor society for full- and part-time adult students. Professor Henriette Pranger, Dean of Faculty, concluded the ceremony by congratulating all the new honor society members as well as the hundreds of guests and family members present in the Goodwin Auditorium. Goodwin College will soon have a brand new outdoor beach volleyball court following a generous $5,000 grant from the Manchester Road Race. Flo, one of the Goodwin Navigators. 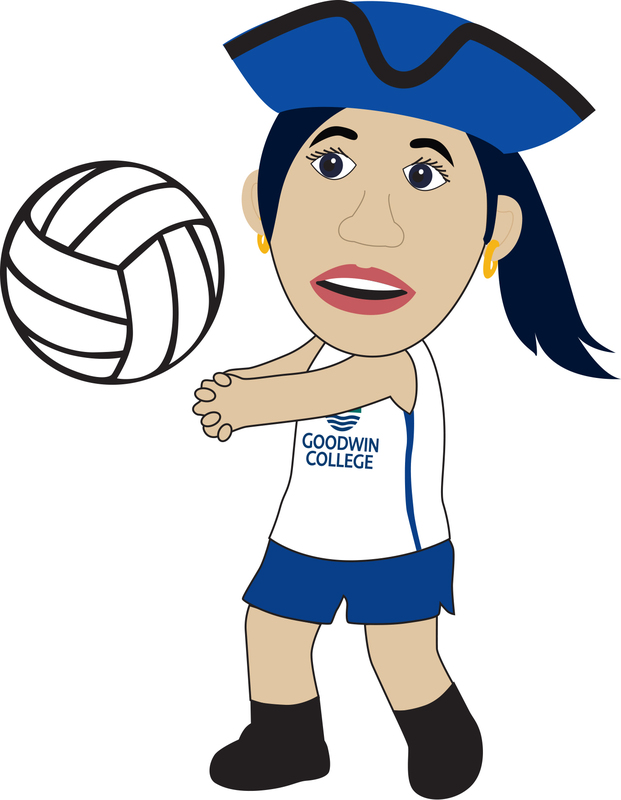 The grant will provide space for Goodwin to create an intramural volleyball team and enhance recreation opportunities for its students. Additionally, students at the two magnet high schools built on the River Campus will have access to the court for physical education purposes. Dr. Tris Carta, the president of the Manchester Road Race, said the organization was pleased to grant the funds to Goodwin. “We are very much behind sports in the Manchester area. Goodwin College has some great students and we believe that they should have ways to express themselves athletically,” Carta said. The funding will also go toward uniforms and equipment for Goodwin’s growing network of club and intramural sports. The Navigators field competitive indoor soccer and basketball teams, playing against area colleges and in local leagues; they are looking to double student involvement in athletics. Goodwin is still in the early stages of developing its athletics program. Until gymnasium facilities are completed in 2014 at the Connecticut River Academy and the Pathways Academy of Technology and Design, Goodwin will continue to practice athletics at facilities provided free-of-charge through organizations like the East Hartford Parks and Recreation Department and Pratt & Whitney. 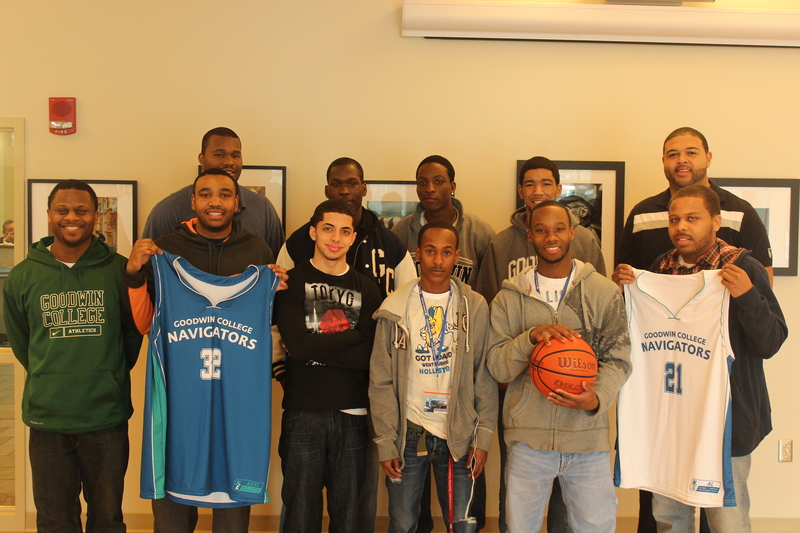 The Navigators basketball team stands for a photo prior to heading to a winter tournament in Boston. Through the new athletics grant, other Goodwin teams and clubs will also be able to travel and get uniforms. Goodwin has played and practiced softball at Hockanum Elementary School, with the Town of East Hartford lining the field and maintaining the site. The Pratt & Whitney Aircraft Club on Clement Road has provided a place for the Navigators to play basketball, including hosting an intercollegiate tournament. The Manchester Road Race has become a Connecticut tradition, run every Thanksgiving Day. The 4.748-mile race draws thousands of runners and spectators to Manchester, in the process raising money for charitable causes. Goodwin College is one of more than 20 organizations to receive funding through proceeds from 2012 Manchester Road Race, which Carta called a “bumper year” for charity fundraising. In all, the Manchester Road Race provided more than $122,000 to local causes. The Nightingale Award for Excellence in Nursing, Connecticut’s largest statewide nursing recognition program, is bestowed upon those in the nursing field who represent the legacy and spirit of Florence Nightingale. Ed Kobylanski embodies the essence of Florence Nightingale and is fully deserving of the award that has been bestowed upon him. Kobylanski, an Associate Professor in the Nursing department at Goodwin College, will be honored on May 9th in Hartford, Connecticut. Jan Costello, Chair of the Nursing Program at Goodwin College, believes Kobylanski is the “ultimate educator” and nominated him for this award. “He embraces an incredible amount of passion for the profession of nursing which he in turn imparts onto his students,” Costello stated. As a longtime, 8-year Goodwin employee, he has the opportunity to touch the lives and elevate the careers of many nursing students, as evidenced by the sentiments of former students who said Kobylanski helped shape their professional paths. A former student, Monique Burgess, recalls Kobylanski’s ability to connect with students. “He is capable of relaying his knowledge onto his students in a way that you don’t even realize you’re learning. He has such a vast knowledge and he’s just a fantastic teacher. He really has the ability to inspire everybody else to do their best and you can tell that he just absolutely loves what he does,” Burgess said. Another former student, Alec Spooner, said Kobylanski has been a mentor to many. “He is very compassionate and takes all of his students under his wing. He helped restore faith in my career. He helped me find my path,” Spooner said. Kobylanski received his Bachelor of Science in Medical Record Administration from Daemen College and went on to hold executive leadership and management positions in hospitals for over 29 years. Ed then attended Saint Vincent’s College and received an Associate of Science Nursing degree. Part of the “new phenomena” of second career nurses, he decided to make this change in his life to help others. He became a registered nurse in 1998 at the age of 43. He went on to receive his Masters of Science in Nursing Management from the University of Hartford. “Florence is known as a leader and I hope I can be a leader and educator for Goodwin College nursing students. I hope I can inspire others to find the Nightingale in themselves,” Ed stated. It is obvious that he has done just that. Goodwin graduate Matthew Lindberg credits Kobylanski with reinvigorating his interest in the nursing profession, though the Nursing Program was a challenge to complete. “I doubted if I was going to stick with the program. Ed really turned everything around for me and helped me realize my passion and that’s something that nobody has done for me,” he said. On Wednesday, April 3, several community partners gathered at Goodwin College to share information about their services and ways they are serving the community. There were representatives from several partners including Greater Hartford Legal Aid, Women’s Independence Network, Sexual Assault Crisis Service, and Mutual Housing Association, and Community Health Resources. Every month different providers throughout the Greater Hartford come together to inform, discuss, and learn about different services being offered by agencies within the community. This monthly meeting allows providers to obtain a better understanding of the criteria of eligibility, referral process, and more. Greater Hartford Legal Aid is a not-for-profit law firm whose staff provides clients with free representation for civil legal issues. Their mission is to “achieve equal justice for poor people, to work with clients to promote social justice, and to address the effects and root causes of poverty.” Since 1958, GHLA has represented thousands of clients striving to protect their legal rights, advocate for fair solutions, and secure their basic human needs. They provide services for children such as special education, school discipline, homelessness, and rights to health care. They also handle cases for employment, disability, family, government benefits, HIV/AIDS, housing, immigration, and seniors. For more information visit their site at www.ghla.org or call 860-541-5000. New Britain’s Sexual Assault Crisis Service (SACS) offers assistance to sexual assault survivors and their loved ones. All services are confidential and free. SACS serves towns in Hartford County, Plymouth, and part of Tolland County. SACS focuses on empowering survivors of sexual assault to make their own decisions. They provide a safe, judgment-free, healing environment for those seeking help. Confidential help is available by calling their 24-hour hotline at 1-888-999-5545. For more information visit their website: http://ywcanewbritain.org/sacs/. Mutual Housing Association is committed to providing affordable housing and revitalizing neighborhoods in greater Hartford. They are able to accomplish this through developing affordable homeownership opportunities and providing housing counseling and technical assistance for homeowners and tenants. Their Ready to Rent (R2R) program can provide those in need the confidence and knowledge to succeed until they are ready to buy their first home. If past choices have tarnished rental history, R2R can give you the tools to find new entries to good housing. For more information visit their website: http://www.mutualhousing.org/. Community Health Resources (CHR) provides those who are homeless, living in shelters, or fleeing domestic violence with a place to live. Their program allows those who need a boost to get on their feet, keep their family housed, and reach their dreams. The Community Partners Monthly meeting is open to the public. Anyone is encouraged to attend the monthly meetings to ask questions, voice opinions, and make connections with other members of the community. Face-to-face networking and collaborating with one another is much more personable in building a real connection. Meetings will be held in the Community Room from 9-10:30 on the first Wednesday of every month. 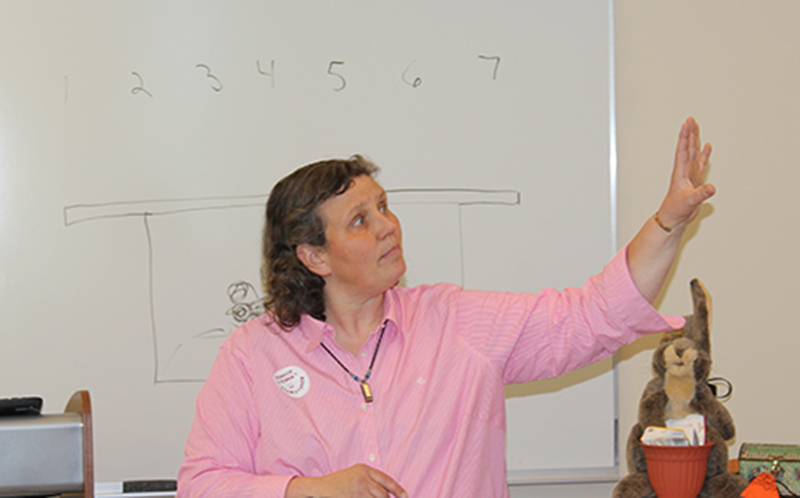 On Thursday, May 2, Goodwin College hosted its fourth annual Early Childhood Education Literacy Conference. Run by the College’s Early Childhood Education and Child Study programs, the conference brought in visitors from throughout the region to learn strategies and share ideas on how to teach children to read. Presenter Carolyn Stearns gives a workshop blending story and song during the ECE Conference. This year’s theme was “Linking Language and Literacy,” with the keynote address given by author and performer Donna Washington. Attendees also broke into smaller workshops and a number of vendors were on hand selling books, crafts, and other items designed to help children learn to love reading.